The CS50 Bluetooth hearing amplifier by Sound World Solutions is yet another personal hearing amplification device designed to help people with varying degrees of hearing loss to hear better and more clearly. 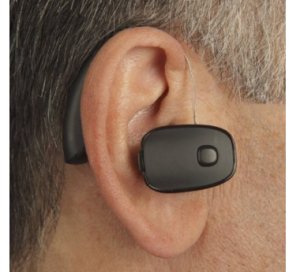 It’s a two-piece behind-the-ear hearing device that works on all-digital technology. As with other hearing amplifiers, the CS50 personal hearing amplifier is a non-prescription hearing aid. It’s a much cheaper alternative to audiologist-prescribed, custom hearing aids, which usually cost thousands of dollars and are obviously not affordable for everyone with some degree of hearing loss. What makes the CS50 stand out from most other personal hearing amplifiers is its built-in Bluetooth connectivity feature. This feature allows the user to connect the device to any Bluetooth enabled smartphone (such as iPhones and Android devices). With the amplifier connected to a smartphone, the user can change the amplifier’s setting using their mobile device — thanks to the free CS50 Customizer App. This app allows the user to personalize the device to their unique amplification needs without having to touch the device. In addition, the CS50, when connected to a smartphone via Bluetooth can serve as a handsfree device. This is particularly useful for people who struggle to hear the voice on the other end during phone calls. The CS50 Bluetooth hearing amplifier comes pre-programmed with 3 different amplification modes: Baseline (default mode), Restaurant mode, and Entertainment mode. The Restaurant mode is most suitable for social gatherings, where there is moderate to loud noise, while the Entertainment mode is most suitable while watching TV or in the cinema. With these different amplification modes, the user can choose the option that best suits their hearing needs in any situation they might be in. Unlike most other hearing amplifiers, the CS50 Bluetooth sound amplifier runs on a long-lasting rechargeable battery. This makes the device a great option for old people who would find it difficult to change batteries often, and for other people who wouldn’t like to spend regularly on replaceable batteries. Each full charge of the CS50 battery delivers for up to 15 hours of use. This means daily charging is required for users who use their amplifier virtually all the time. Each unit of the CS50 Bluetooth hearing amplifier comes with the 3 ear tips of different sizes, 2 rechargeable batteries, 1 charger kit, 1 cleaning tool, and a carrying case. As of the time of this writing, the CS Bluetooth Sound Amplifier had 55 reviews on Amazon, of which 43 percent were 5-star ratings and 24 percent were 4-star ratings. That’s a 67 percent customer satisfaction. Overall, the product had 3.9 out of 5 stars. Some buyers admitted that the CS Bluetooth amplifier worked better than the prescription hearing aids they previously used. But as expected there are negative reviews by unsatisfied buyers. A buyer complained that it was hard to adjust the volume without having the battery dismount from the ear mount. Some other buyers complained that the devices picked up every sound — wanted and unwanted. And few buyers complained that the device just didn’t work for them at all. 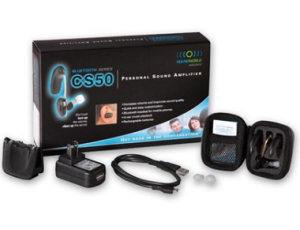 The CS50 Bluetooth personal hearing amplifier by Sound World Solutions is a great device that has helped many people with hearing loss improve their hearing. While there were some negative reviews about the products, none of the cited complaints were general. And we hold that the amplifier is one of the few very good ones in the market at the moment. 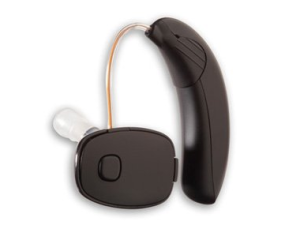 We recommend this product to anyone with mild to moderate hearing loss, especially since it’s much cheaper than prescription hearing aids, and since it comes with unique features like Bluetooth connectivity and rechargeable batteries.